The second Roman Catholic priest to serve the St. Malo Parish was Father Abel Noret, who arrived from France on 5 November 1895. Exploring the parish a short time after his arrival, this site caught his attention. 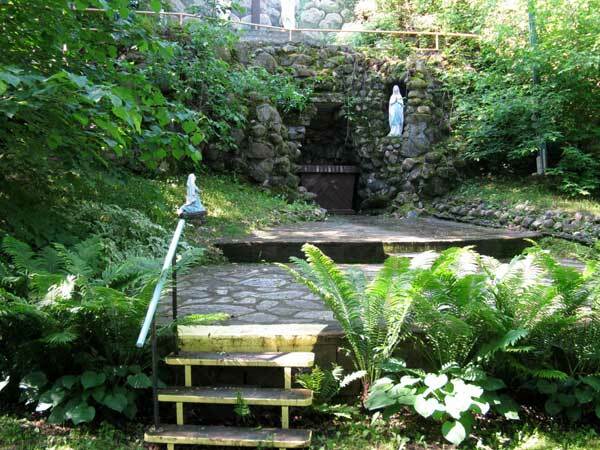 A wooded, remote spot before the construction of Highway 59 and the Provincial Park, its proximity to a small river reminded him of the Grotto of Lourdes in France, where the Blessed Virgin had appeared in 1858. He decided to erect a grotto here in her honour. In July 1896, with the voluntary aid of some parishioners, Noret began working on the project. Brush was cleared and hollows were filled; a small chapel was constructed on the south bank of the river. By 1902, the chapel was replaced by an actual grotto built with fieldstones from the area. Noret, working with David Morin and Léger Lambert, completed the stone walls and the niche of the Madonna. There still remained the closing of the arch of the main vault. A keystone was needed. Hunting about, they found, high on the bank, a large flat stone of the proper dimension. But how to get it into position? They had no crane. The stone was large and heavy, and the bank was steep. “If we roll it down,” said Father Noret, “we risk smashing everything—rock and grotto. Yet we’ll risk it.” The three men heaved, and the large flat rock started to slide down the bank. Chance, luck, heavenly intervention, call it what you will, but the rock stopped at the precise place needed for the keystone. On 28 July 1906, Archbishop Langevin of St. Boniface presided the pilgrimage and blessed the new chapel which brought together a large number of people. In 1939 the biggest change came about. The old altar shelter was replaced by a much larger canopy. The aesthetic lost out to the practical. Visitors could no longer catch the enchanting panorama of the little valley that had hitherto been one of the joys of those emerging from the chapel. Other changes were made. To obtain more seating space before the grotto, the little river had to be directed to a new channel. From the bank to the altar descending paths were constructed to be able to go down to the shelter and grotto area. Though a bit steep and causing one to descend somewhat breathlessly these semi-circular ramps added another note of resemblance to the Lourdes cenacle in France. Information for this page was extracted from a pamphlet about the St. Malo Grotto obtained by Tim Worth.